Approach," by CAPT W.S. Szczy- pinski Jr., USN, and CDR J.J.
M. Lee Rice, president, Shipbuild- ers Council of America. For additional information and registration forms, contact Mrs.
Street, Alexandria, Va. 22314; tele- phone (703) 836-6727. City, Calif., has been awarded a $6,145,000 firm-fixed-price contract for the overhaul of the tank landing ship USS Qan Bernardino (LST- 1198). The Supervisor of Shipbuild- ing, Conversion and Repair, Ports- mouth, Va., is the contracting activ- ity. Baltimore area chain of personal computer retailers. Press. Its clients include many of the major shipping companies in the world. 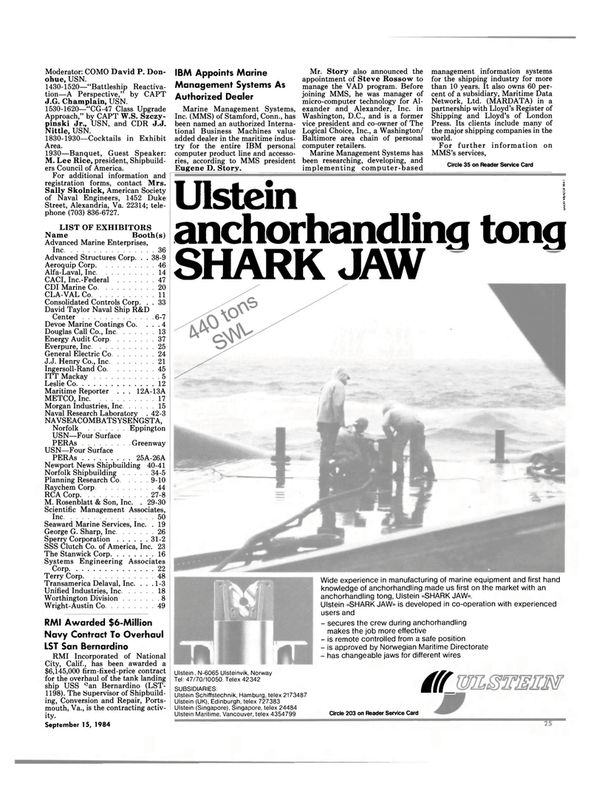 Wide experience in manufacturing of marine equipment and first hand knowledge of anchorhandling made us first on the market with an anchorhandling tong, Ulstein «SHARK JAW».